first. sometimes i hide from the internet. hence my recent absence. second. i love potatoes in my pasta. i do and it is an obsession. i started throwing the yummy chunks of goodness into my papperdelle a few months ago when i realized i NEEDED a ton more carbs than normal and, well it just stuck. above is my dinner from the other night. 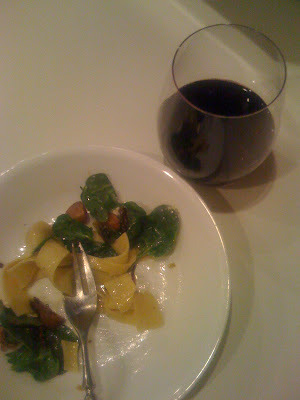 pasta, spinach, roasted potatoes and leeks, and brie. oh yum. You crazy lady! Pasta and potatoes? That would make me explode! I hide too. I want to hide now. I'm glad you're not hiding any more.